Two weeks today is the start of America's largest genealogy conference, RootsTech 2013, where I am proud to have been selected as an official blogger. As this is my first trip to both RootsTech and Salt Lake City, I am not entirely sure what to expect, but I shall be blogging and tweeting while I am there to keep all my followers up-to-date with my impressions, news and gossip. I also hope to have the chance to interview some speakers and attendees, aiming to focus on international issues. My interest in RootsTech started when I was able to watch many of the live streamed broadcasts last year, from the comfort of my own home. Over the course of the following few months, I started to feel that, as a professional genealogist, I wanted to to attend this important conference in person. I knew Audrey Collins, of The UK National Archives, had attended before and when she told me she would going again this year (albeit in a private capacity), I decided to book my conference place, my flight and my hotel. This was back in October 2012. Marie Dougan, of Scottish based genealogists, Ancestral Consultants, and ex-Strathclyde student, will not only be attending, but she is running an international panel session with American A C Ivory and Australian Jill Ball, of Geniaus, entitled "The Genealogists' Gadget Bag". Else Churchill, of the London-based Society of Genealogists will be attending and also giving a talk at the Family History Library the day before RootsTech, entitled "Treasures of the London Society of Genealogist On Site and Online". Alec Tritton, chairman of the Halstead Trust, will also be in attendance, and rumoured to possibly be speaking. Jeanette Rosenberg and her partner Mark, of the Jewish Genealogical Society of Great Britain, another ex-Strathclyde student. Geoff Swinfield and Di Bouglas, of Geoff Swinfield Genealogy Services who, like me, are attending RootsTech for the first time. Bruce Durie, founder and ex-Director of the Genealogical, Heraldic and Palaeographic Studies Programme at Strathclyde University, where yours truly studied for the PG Certificate and Diploma. Of course there may be other UK Genealogists attending RootsTech 2013, whom I am not aware of (or dare I say I might have forgotten about). If you are British and heading off to RootsTech 2013, do please let me know. For those who cannot attend in person, there will be live streamed sessions as in previous years. 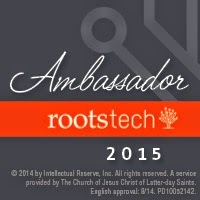 Please keep an eye on the RootsTech website for more details. For those who are going, I'll see you there! Thanks I guessed that slot might be you, but for some reason it's not showing the speaker's name yet. Looking forward to catching up. I look forward to meeting you and the rest of the Brits! See you soon. You too Amy. So many US genealogists / bloggers to try and meet. The Commonwealth will have about a dozen reps from downunder too. Look forward to catching up with the Brits. I'm excited that another foreign Official Blogger will be in the Media Hub. See you there! Me too, and I'm very grateful to have an experienced Official Blogger to give me tips! I notice that Calico Pie have a stand at Rootstech. Wonder if that means more Brits will be there. (I'm a Family Historian user). Well it probably means that the Calico Pie people will be there, unless they have a US agent. I don't use FH as I'm a Mac user myself. In the FH newsletter it was announced that Simon Orde will be there.